CI Online: Welcome to a virtual classroom! | Magister P.
In the screenshot below, you are looking at my “Classroom” layout for elementary students (I can create as many custom layouts as I need). The windows, called “pods,” can be hidden or revealed with a click. Everything remains saved and exactly how I left it (persistent). 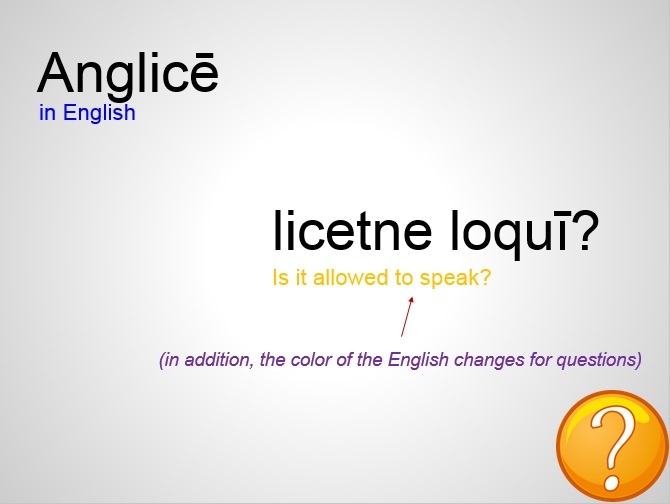 I have essentially unlimited wall space for vocab and English equivalents, and can show as much or as little to suit what we need…a huge win for TCI Online. As you can see, we are beginning a fourth sentence of a Dictātiō. 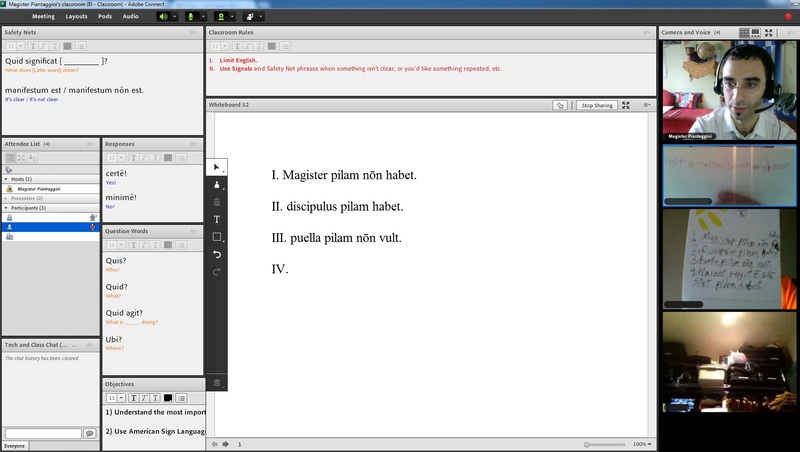 Strangely enough, I find it more comfortable to give a Dictātiō remotely than in the room right in front of students. There’s something about walking over to a desk, grabbing the keyboard, then typing onto the screen that feels off…almost as if I’m less present than when teaching online. Since that’s the case, I tend to write on a whiteboard, and recently I’ve discovered that I can type a LOT faster than I can grab a different color pen and write on the board. This other layout below is a virtual “Lobby” that I use to talk about the day and weather. I can give a student (the Mutātor Diērum student job) permission to drag the day’s date onto the left side of that whiteboard, pretty much like magnetic strips in my brick and mortar classroom, then have a few things to say about the day, or date. 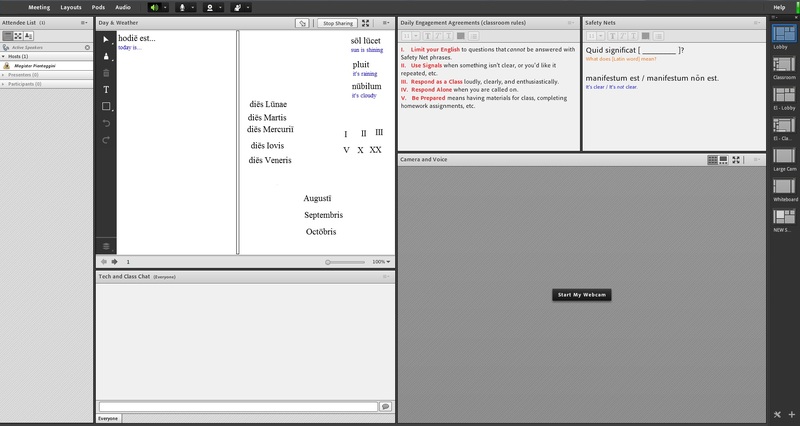 Once everyone is logged in, I switch to the “Classroom” layout show above, and begin some more CI. What does a class look like? I would post a link to a recorded class, but I can’t. At some point I’ll get some video releases, or edit a recording by blurring images, and editing out names. You see, random people aren’t allowed in the room; we value security just like in a brick and mortar school. Earlier this year a few observers requested access to my class, but I denied them entry because no one gave me the heads up that we would have guests that day. If you have good eyes, you’ll notice on the left side of the first screenshot that one participant’s microphone is disabled, and another muted. I have control over this…another win for TCI Online. When a student wants to chime in, they alert me by changing their status to “raise hand,” and I can easily enable or unmute them. Other alerts include signals that are part of our DEA rules, such as “speed up” ( I have NEVER seen this signal used, even in brick and mortar environment), “slow down,” “agree/disagree,” etc..
You can see how there’s quite a bit of guiding going on. Despite what you might think, after designing my initial PPT template, this doesn’t require much work. I find this product to be incredibly helpful for beginners to learn what class is going to be like, especially through a computer. I might even use this exact presentation to start my year in a brick and mortar setting. An unexpected challenge, though, was with simple questions I normally would ask orally. 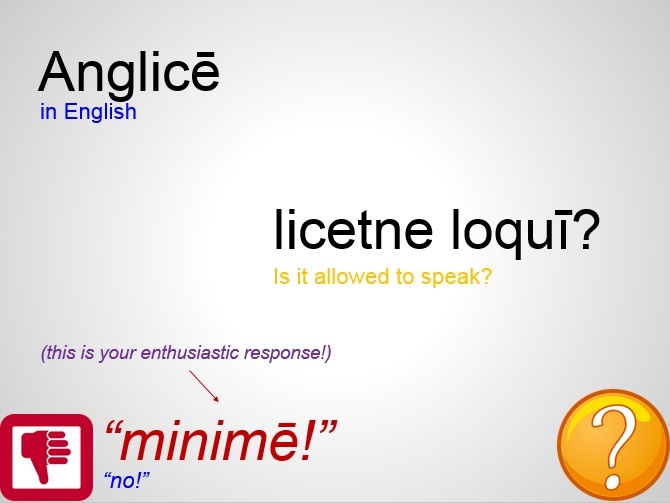 Despite establishing meaning of all words, my students needed more guidance. I have a feeling this is because of online format. After all, any type of “Make Eye Contact” DEA rule doesn’t really apply online since everyone is staring at small camera windows on a screen. In class, it’s very clear which student I walk up to and address, but online, not so much. Here’s an example of how I make questions clearer. 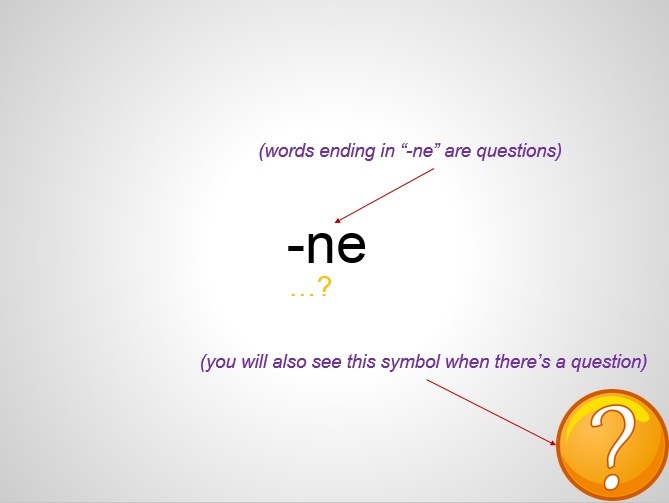 When I attempted to ask this without those words, images, and cues, the students were unsure of themselves, who I was speaking to, and whether or not there was a question about a presentation slide, or something actually going on in their, or my room. Those are huge drawbacks to TCI Online. Still, I value CI enough to spend time on these PowerPoints in order to make it work Online. 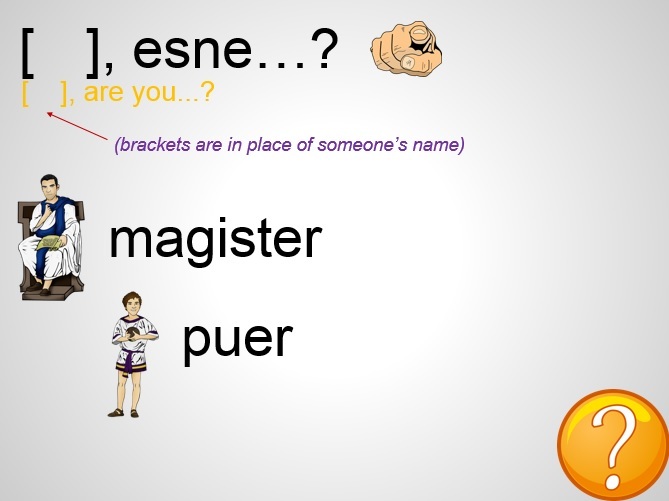 In case you are wondering, I will make the slides available once enough revising has been done, and they will be keyed to TPR Vocab used with the 52 Most Important Latin Verbs.